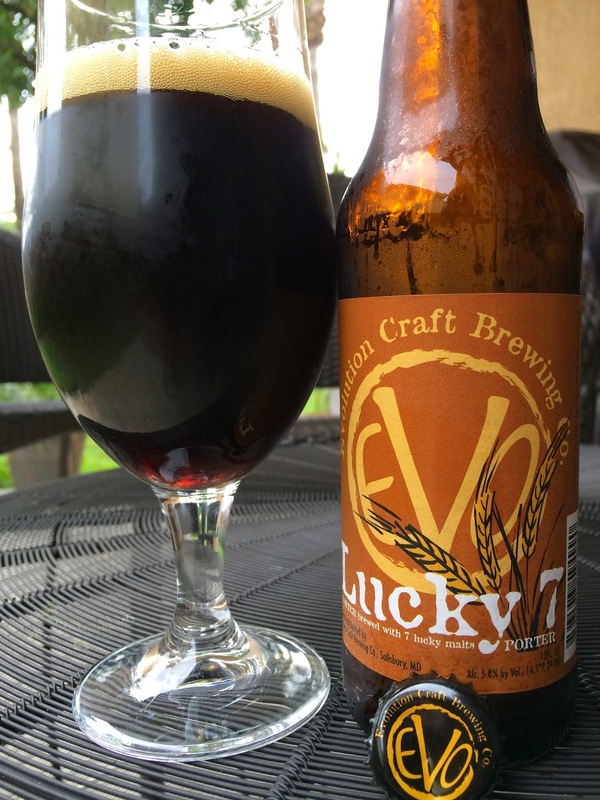 I decided Christmas was the perfect day for a beer named Lucky 7 Porter. (Yes, I realize you're not reading this on Christmas, but it is when I drank it). First, I'd like to be lucky today (or tonight), but second, this is the time of year that my Uncle and I used to drive around Easton, PA looking for a Christmas Eve location to drink. That always ended up being Porters' Pub! This beer is brewed by Evolution Craft Brewing Company in Salisbury, Maryland and is available exclusively at Total Wine if you're buying in Florida. The label is simple, just a few sprigs of barley on a brown background. The tagline states that this is "a PORTER brewed with 7 lucky malts." 5.8% alcohol, 14.5°P, 24 IBU. Sweet chocolate and light roasted malt aroma, not powerful but nice. Flavors start with much more roast than the aroma let on. Coffee, chocolate, not sweet, not bitter, though that roast approaches "aggressive." Smooth. More lingering roast at the finish. Simple but nice flavors. Check it out.